In our post about Building our Discipline Muscle, Courtney asked a great question. 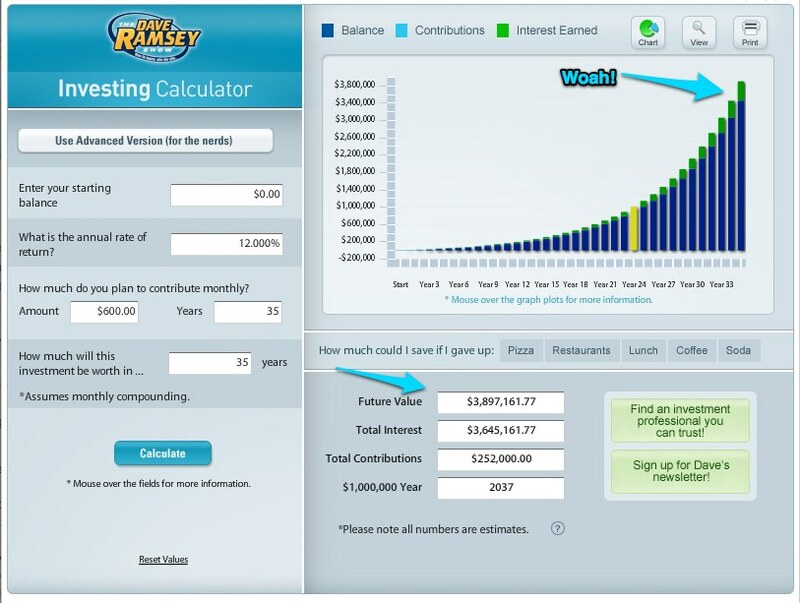 What does our plan for retirement savings look like? And if you're not saving for retirement, what about all the money you are losing out on while not saving in your 20s? Those are great questions, and this is something that comes up in our own discussions from time to time. The answer comes down to sticking with a plan that Dave Ramsey has developed over the last 20 years. If you haven't yet, I strongly encourage you to take his class, Financial Peace University. It will change your life if you allow it to. It changed ours for sure! Basically, Dave says that until you are consumer-debt free (everything but your mortgage), you shouldn't be saving for retirement. He's not saying to pull out the money you have already put in, but rather just put your contributions on hold until you can finish your debt snowball. The point is that you focus with all of your intensity on paying off your consumer debts, one at a time, until they are all gone. Once you have all of your cars, student loans, credit cards, furniture, etc., paid off, you will be free to use that extra income on other things. The next step is to build your emergency savings fund, and then your retirement savings. We are currently working on saving up our emergency fund, so our retirement is still on hold. We should be done in another year and then we will start putting a hefty amount of money into our retirement account every month. Until then, we stay the course. We are praying that our house sells quickly and we can use the proceeds to catapult our financial plan by fully funding our emergency fund and jump starting our retirement savings. So this is what we cling to right now. We are both 27 and still have time to work the plan. It's tough, but we try to remember that it's a marathon, not a sprint. Our debt-free story has already come so far, and we are super pumped to see how far we can make it before retirement. What are your thoughts around retirement savings? Anyone else on hold for now?